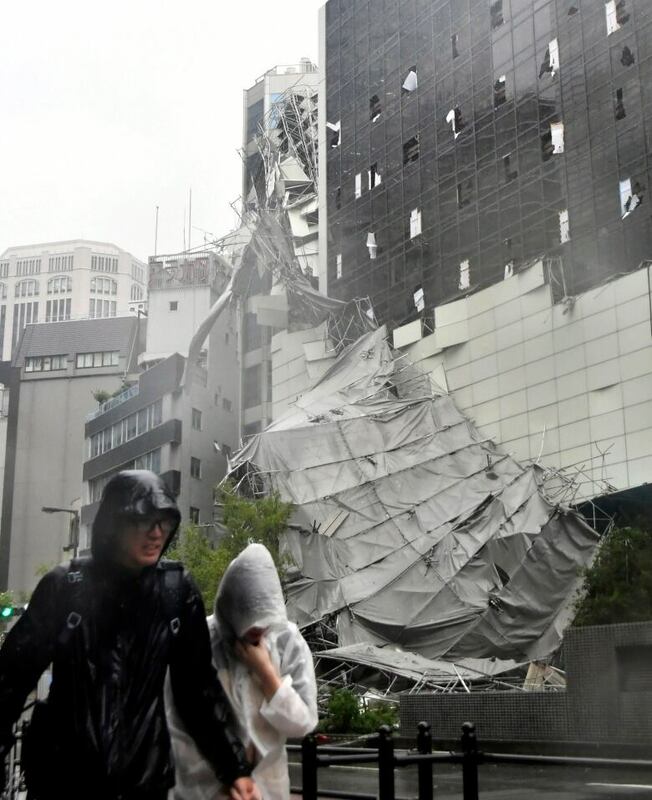 A powerful typhoon has slammed into western Japan, inundating the region's main international airport, blowing a tanker into a nearby bridge, and leaving thousands of air travellers stranded. 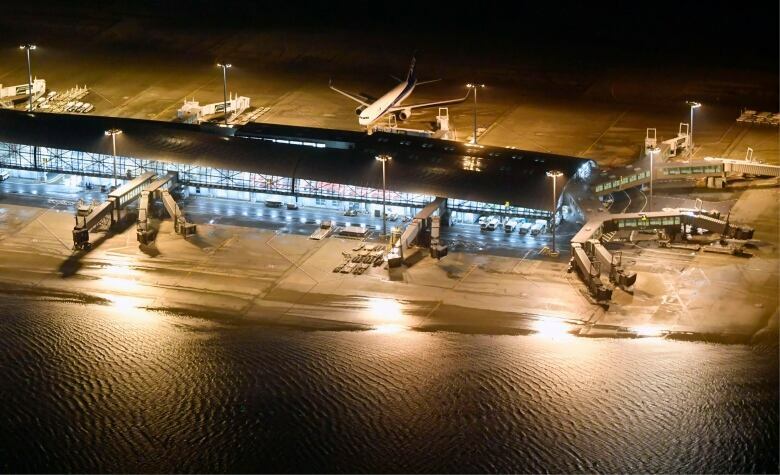 A powerful, deadly typhoon blew through western Japan on Tuesday, causing heavy rain to flood the region's main offshore international airport and high winds to blow a tanker into a connecting bridge, disrupting land and air travel. The storm has killed at least eight people and injured 150 others, NHK national television and disaster officials reported. The storm was heading north across a swath of Japan's main island of Honshu toward the Sea of Japan. 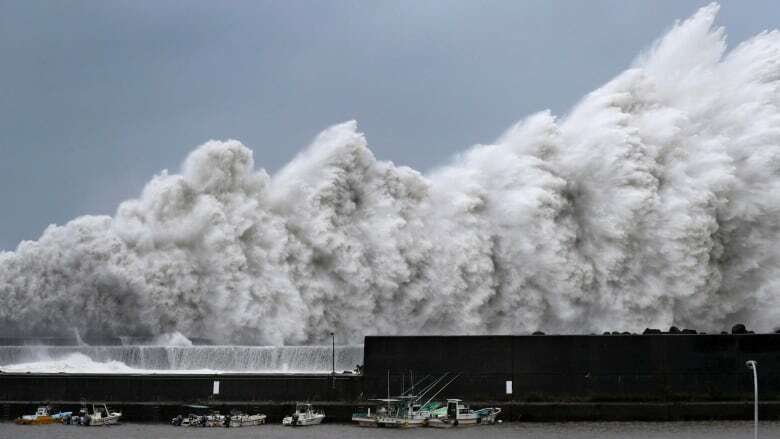 It was off the northern coast of Fukui on Tuesday evening, local time, with sustained winds of 126 km/h and gusts up to 180 km/h, the Japan Meteorological Agency said. Evacuation advisories were issued for more than a million people at one point, the Fire and Disaster Management Agency said. 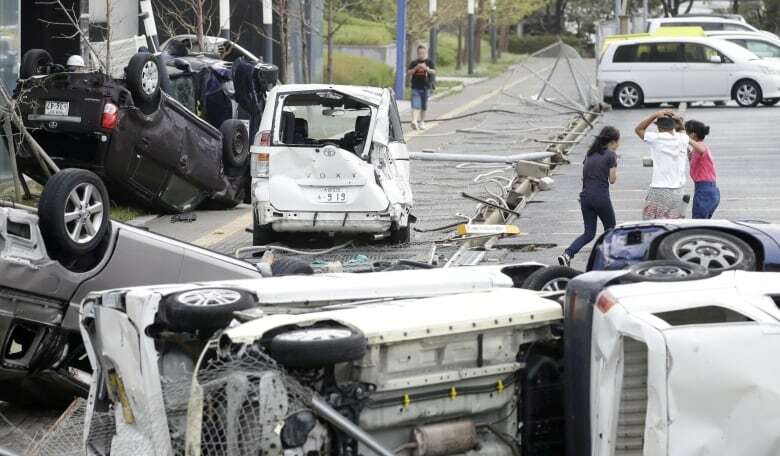 Wind gusts of up to 208 km/h were recorded in one part of Shikoku. Among those killed was a man in his 70s, apparently after he was blown to the ground from his apartment in Osaka prefecture. Police said five others died elsewhere in the prefecture after being hit by flying objects or falling from their apartments. In nearby Shiga prefecture, a 71-year-old man died when a storage building collapsed on him, and a man in his 70s died after falling from a roof in Mie, officials said. Around 100 millimetres of rain drenched one part of the tourist city of Kyoto in an hour, with as much as 500 millimetres set to fall in some areas in the 24 hours to noon on Wednesday. 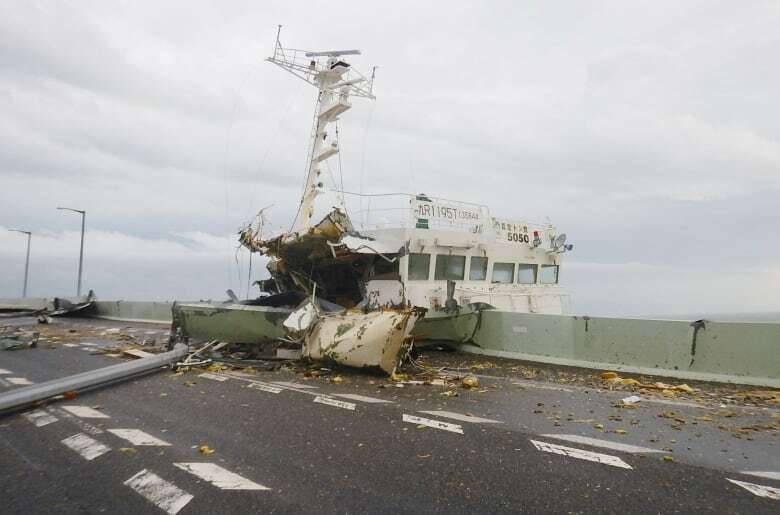 A 2,350-tonne tanker that was mooring slammed into the side of a bridge connecting the airport to the mainland, damaging the bridge, making it unusable, and leaving about 3,000 passengers stranded at the airport, Transport Ministry official Mitsuo Nakao said. The tanker was also damaged, but its 11 crew members were not injured and remained aboard, according to the coast guard. More than 700 flights were cancelled, according to Japanese media tallies. High-speed bullet train service was suspended from Tokyo west to Hiroshima, though service resumed partially later Tuesday when the typhoon left the region. NHK public television showed passengers sitting or lying on the floor of the airport terminal in Osaka, in the dark without air conditioning. An Air Canada Rouge flight bound for Osaka from Vancouver was turned back while flying over the Pacific Ocean due to the storm. Flight 1951 was in the air for several hours before it turned back to Vancouver early Tuesday. Toyota Motor Corp. said it was cancelling the night shift at 14 plants. 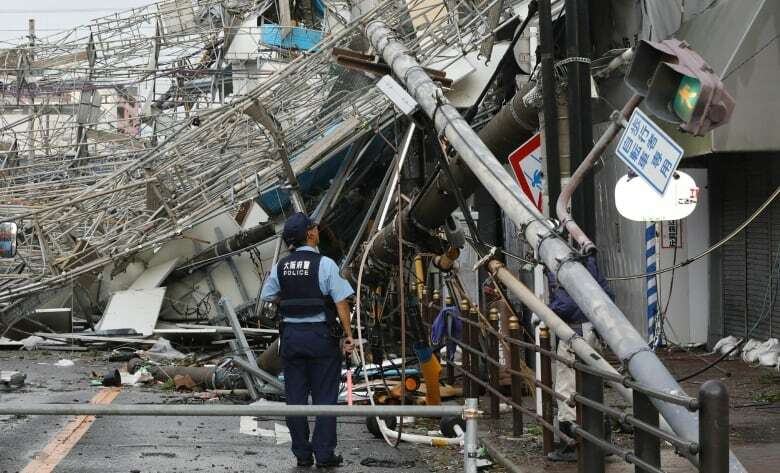 The storm also cut power to hundreds of thousands of homes and caused schools, shops and factories to close in Osaka, Japan's second largest city and a business centre. Elsewhere in Osaka, the Universal Studios Japan theme park and U.S. consulate were both closed. Prime Minister Shinzo Abe cancelled a scheduled trip to Kyushu, Japan's southernmost main island, to oversee the government's response to the typhoon, said Chief Cabinet Secretary Yoshihide Suga. Video on Twitter showed a small part of the roof of Kyoto train station falling to the ground. Other video showed roofs being torn off houses, transformers on electric poles exploding and a car scudding on its side across a parking lot. The typhoon first made landfall on the island of Shikoku and then again near Kobe on Honshu. Television footage showed fallen tree branches and high seas overflowing onto low-lying areas.